After two year implementation of the project “Piloting and multiplying new cooperative model in the Mekong delta”, the quality of cooperatives has been improved dramatically, according to the Ministry of Agriculture and Rural Development at a yesterday meeting organized by the Ministry and the People’s Committee in Dong Thap at the heart of the Mekong Delta. Development of cooperative enterprises had been not good in 2016 and earlier. After the Prime Minister approved the project in March, 2016, 156 cooperatives and 19 groups of cooperatives had been selected in the pilot project. As the years went by, cooperative quality was improved. Specifically, cooperative size and capital increased and its managers are more effective. In addition to carrying out the pilot project, the newly established cooperatives have mushroomed in the Mekong delta. By 2018, around 1,803 agricultural cooperatives have been set up in the region making up 13 percent of the country’s cooperatives with 230,000 members. From 2016, the Mekong delta is one of three regions with leading number of newly established cooperatives. Noticeably, many agricultural cooperatives actively have connected enterprises to build produce chains; for instance, Tan Thuan Tay Cooperative in Dong Thap Province has connected with Long Uyen Company to grow and sell mango; Binh Hoa Phuoc Cooperative in Vinh Long Province and Mekong Vegetable Company have linked for supply and consumption of rambutan or other cooperatives in Tien Giang province linked with enterprises for consumption of VietGAP and GlobalGAP Tan Lap pineapples, Ngu Hiep durian and Cho Gao blue dragon. Linkage in agricultural production in chains is urgent in the context of climate changes, said Head of the Department of Economic Cooperation and Rural Development Dr. Le Tien Thinh while Dong Thap Party Secretary Le Minh Hoan said that the Mekong delta ought to re-arrange its production in each province for sustainable development in the climate change. Accordingly, cooperatives should be held as vital link between farmers and enterprises. 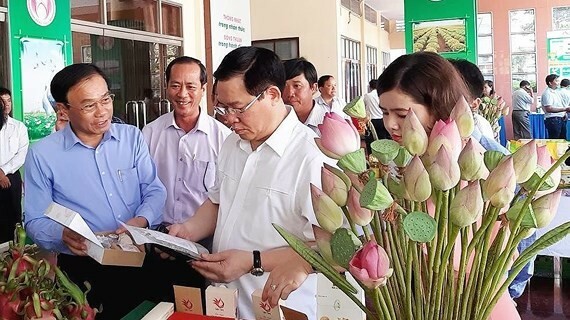 Deputy Prime Minister Vuong Dinh Hue praised the meeting organizer when the government was reviewing 15 year development of cooperative economy and 10 year implementation of the circular on linkage between farmers, enterprises and scientists in the field of agriculture. For years, the government and the Party have issued policies to improve cooperative activities and more new cooperative models have adopted safe production methodologies and advanced technologies as well as linked with enterprises for produce consumption. Deputy PM Hue noted that the Mekong delta is facing challenges because of climate changes; therefore, there should be a shift from traditional agricultural production into modern types for sustainable socioeconomic growth to meet consumers’ demand. More importantly, he stressed that cooperatives should take heed of quality rather than quantity and develop safe agricultural products linked with chains. 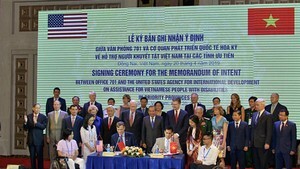 The meeting saw the participation of Deputy Prime Minister Vuong Dinh Hue and leaders of agencies.